Traffic controller KOMKON KDK (configurable traffic controller), is designed to control traffic lights signals at traffic lights intersections. Controller KOMKON KDK can work alone and as a part of automated traffic management system (ASUDD). Technically KOMKON KDK is implemented on the modern components, also the configuration and operational algorithms may vary according to customer requirements. Thanks to the reliability, relatively low cost, flexible service traffic controllers KOMKON KDK is now widely disseminated in Ukraine and other countries. Traffic controllers KOMKON KDK are manufactured in accordance with the applicable requirements of DSTU 4157 – 2003 (in part with requirements for road controllers) and GOST 34.401-90, as there are the appropriate certificates of conformity. 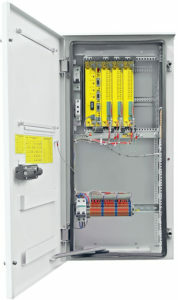 The rack for the installation of modules. Power source module – KDIP. Switching panel based on WAGO pads for screwless connection. The lamp for the case lighting (for use by operational staff). Radio station with power source. Module for connection to IP network. * Controllers with 48, 56, 64 channels are available by special order. The duration of the main phase cycle 1 – 254 sec. The duration of the intertact 0 – 254 sec. Discretisation of timings setting 1 sec. The modular principle of building KDK allows replacement of failed units, modules and malfunction diagnostic of controller directly on operational site. LED indicators show the status of the controller and peripheral devices, which simplifies their diagnostic. Energy independent real-time clock and nonvolatile memory for temporary programs allow resuming of correct work of the controller in case of disconnection or power failure. Configurable controller’s case is equipped with internal lighting, additional outlets, automatic overload circuit-breaker, has a reliable lock system. Programming of controller is provided using an external flash memory modules within fifteen seconds. repeats checkout after 2 hours. case of load recovery KDK enables operational mode. All channels of controller are protected against overload and short circuits. There is possibility of assignment up to 24 programs (using KOMKON SPOD), which will be performed depending on the time, as well as the day of the week. It is possible to connect up to two KVP’s to call the necessary phases. setting the KDK to the daily program. parameters (for details, see the article «Engineers console»). IP-network (twisted pair, fiber, WiFi, WiMax). check the working order of the controller, as well as the working order of traffic lights connected to it (for details, see the article «KOMKON ASUDD»). Radio or line modem (for connection through wired lines) is placed directly on the CPU board of controller. For other communication equipment (external radio modem, radio station, GPRS – modem, etc.) it is specified a place in the controller. Electrical resistance of isolation between short-circuited contacts of the power pad XF1 and the controller chest is not less than 20 MOm. Electrical resistance of grounding circuits between the chest and grounding bolt is no more than 0.1 ohms. The warranty period of exploitation is set 24 months from the date of commissioning. The warranty period of storage is equal to 6 months from the date of manufacture. The average controllers’ lifespan before the limit condition must be at least 8 years. Mean-time-between-failures is at least 12000 hours for each function or channel.